Angul Recruitment is 34 posts. Interested candidates having required eligibility criteria for the post CDMO Pharmacist, Attendant Vacancies have to send application through speed/ registered post before 16-12-2017. Candidates will be shortlisted based on merit of career assessment. Weightage of marks will be given in the notification. Candidate must be able to read, speak and write in Odia language. 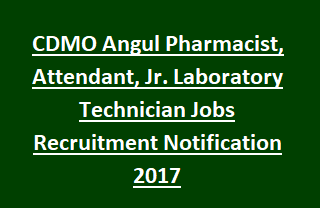 Age of the For more information regarding Office of the Chief District Medical Officer CDMO, Angul Recruitment Important dates, Application procedure, selection procedure, age limits, Pay scale details are given below. Total available vacancies in Office of the Chief District Medical Officer, Angul Recruitment are 34 posts. Age of the applicant must be below 32 years and above 21 years as on 29-11-2017. Age relaxations applicable as per CDMO Angul govt rules. Attendant: Candidate must have passed M.E (7th) class Examination from recognized Board and must be able to read, write and speak Odia. Pharmacist: Must have passed plus 2 in science examination and Diploma in Pharmacy from any recognized Medical colleges/ Hospitals. See the CDMO notification for more details. Pay Scale for Attendant Jobs is Rs. 8070/- per month. Pay Scale for other posts is Rs. 9,500/- per month. Candidates will be selected for CDMO Attendant, Pharmacist jobs based on merit in career assessment. Candidate must be physically and mentally fit.
. Last date to send application CDMO applications through Speed post/ registered post is 16-12-2017 before 05.00 PM.